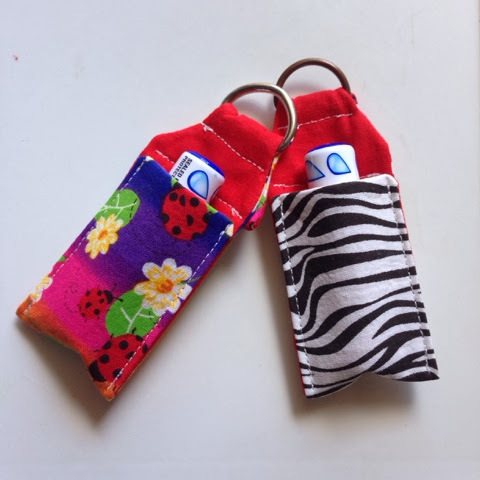 GMHN Quilts by Penny Doucette: More Chapstick keychains! I finished two more Chapstick keychains. They really are great for scraps and they are so quick and easy to make. And I'll admit.... A little addictive. These are also for sale in my shop. I found a pattern on Pinterest that is also for scraps. Bookmarks. I think I'm going to make some of those as well. We have a post wide yard sale coming up in March and I'd like to sell some of my handmade items in addition to typical yard sale items. I figure the more I have made the more likely I am to sell. I don't know though. I would really love to find a craft fair around here but I'm not even sure where to look or how to go about finding and joining them. Then I also have a problem listing my stuff for sale. Mostly my mini quilts. I have a hard time parting with them unless I make them specifically for someone, because then it's in my mind that it's not really mine to begin with. Is that weird?